The CEM of KHADC, H.S. Shylla on Tuesday raised question over the land boundary agreement signed between India and Bangladesh in 2011 and sought detailed explanation from former Meghalaya chief minister Mukul Sangma, deputy chief minister Prestone Tynsong and minister Lahkmen Rymbui in this regard. According to the chief executive member (CEM) of Khasi Hills Autonomous District Council (KHADC), the boundary deal between India and Bangladesh signed in 2011 has affected the residents along the India-Bangladesh border in Khasi and Jaiñtia hills of Meghalaya. “The agreement is a great loss to the people along the international border with Bangladesh. The border pillars that were erected prior to signing of this agreement have been further shifted inside India, and the border fencing will come up at 150 yards away from the border pillars,” Shylla told reporters after inspecting the border areas from Lyngkhat to Dawki on Tuesday. Shylla said Mukul Sangma, who is currently the leader of opposition in Meghalaya Assembly, Tynsong and Rymbui had accompanied the then Prime Minister when he visited Bangladesh for signing the Indo-Bangla land boundary agreement in 2011. “Dr Mukul Sangma, Prestone Tynsong and Lahkmen Rymbui should explain in detail to the people of the state about the agreement which was signed at that time,” Shylla said. The Indo-Bangla land boundary agreement was first signed between then Indian Prime Minister Dr Manmohan Singh and Bangladesh Prime Minister Sheikh Hasina in Dhaka in September 2011. On June 6, 2015, present Prime Minister Narendra Modi signed the final agreement with Hasina in Dhaka for ratification of the 41-year-old agreement for swapping of land between the two countries in the states of West Bengal, Assam, Meghalaya and Tripura. Stating that works for the border fencing have been taken up without getting ‘no objection certificate’ from the KHADC, Shylla informed that he would write to the deputy commissioner of East Khasi Hills district of Meghalaya in connection with the fencing project. 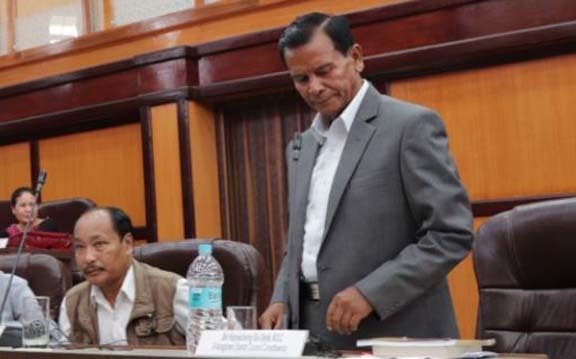 Shylla alleged the state government has insulted the district council adding that Meghalaya chief minister Conrad K. Sangma, his ministers and officers of the state government treated the district council like a ‘department’ not an ‘autonomous’ body.